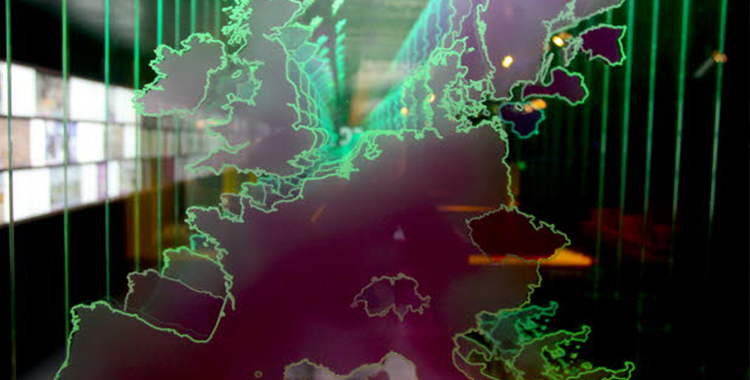 By The New European on	 17 February 2014 Political Affairs, What's Up Europe? Once upon a time they were six. Now, they are 28. We are talking about the Member States of the European Union. In 1952, a common market for coal and steel (the ECSC), and later, in 1957, a European Economic Community (EEC), were solutions to the pressing issue of future European collaboration, after two exhausting and devastating World Wars. The six founding members of what has become the European Union (EU), West Germany, France, Italy, Belgium, Luxembourg and the Netherlands, considered economic interdependence as a way to avoid future conflict in Europe. Since then, integration, in the form of new states entering the union, and of deeper and wider political and economic cooperation, has created the EU we have today. But how does it work when states become part of the Union? In the history of the European project, several enlargements have taken place. The first countries to join in 1973, were Denmark, Ireland and the United Kingdom, and Greece a little later, in 1981. The UK joining the EU was not without controversy at the time, as France’s president, Charles de Gaulle, initially vetoed the country’s application. He feared that the special relationship between the United States and the United Kingdom would increase US influence in Europe. When de Gaulle left office, the UK simultaneously stepped into European co-operation. Spain and Portugal joined in 1986. 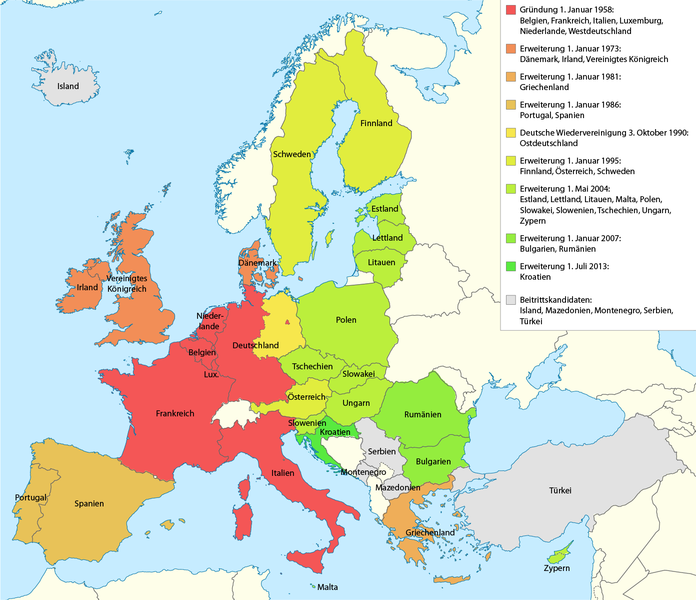 In 1995, Finland, Sweden and Austria joined, and the European Union covered almost the entire Western Europe. The largest, and possibly the most challenging merger, due both to its size and sheer number of countries and people joining, came in the form of the Eastern enlargement, in 2004. Suddenly, the Czech Republic, Estonia, Hungary, Latvia, Lithuania, Poland, Slovakia, Slovenia, Malta and Cyprus were in ever closer union with the rest of the western countries. It would have been considered impossible twenty years earlier, when the Soviet Union still stretched its iron fist around this part of Europe. In 2007, two new siblings entered, Romania and Bulgaria. Croatia is the newest member in the EU, from July 2013. Accession broadly includes three stages. First, the country must show that it fulfils the values of the European project. It is declared in the EU treaties that membership is open to any European country that has “respect for human dignity, freedom, democracy, equality, the rule of law (democratic governance) and respect for human rights, including the rights of persons belonging to minorities.” Any aspiring country also needs to have a functioning market economy and the capacity to cope with competition in the EU, as well as the ability to take on and implement EU laws. These main criteria were defined at the European Council in Copenhagen in 1993, and are hence referred to as ‘Copenhagen criteria’. Once they are fulfilled, a country can official apply for membership and become a candidate country. This is of course only if all the other EU member states have agreed to open up official negotiations. The second step consists of formal membership negotiations. For the candidate country, this means to bring its legislation in line with previous EU legislation, covering 35 different policy fields. These are known as the aquis communautaire, or commonly referred to as chapters. All are non-negotiable, and have to be closed, and all accession criteria fulfilled, to the satisfaction of both sides, before accession can be finalised. An accession treaty is signed, with the final accession date in print. The country is then ready to join the Union! Step three can hence be fulfilled. The process of becoming an EU member can be a long and tedious task. “If you look at Spain or Portugal it took 15 years more or less. I consider it normal that there are stumble blocks” said Dutch MEP Johannes Cornelis van Baalen in an interview with UNITEE. Currently, Iceland, Turkey, Macedonia, Serbia and Montenegro are official candidate countries, but Serbia and Macedonia have not yet started negotiations. For the countries of the Western Balkans (Serbia, Bosnia and Herzegovina, Montenegro, Kosovo, Macedonia and Albania), additional conditions for accession were set out in the so-called ‘Stabilisation and Association process’. The criteria mostly relate to regional cooperation and good neighbourly relations, which must be met before the countries can be considered for application of Union membership. The process of enlargement is in itself not without controversy. In the case of Serbia, there is some opposition on its position on Kosovo, and in Iceland membership is unpopular due to fishing rights and the effects of the 2009 financial crisis. Critics also question some countries “belonging” to Europe and that the EU is facing an institutional overload in terms of effective decision-making. Turkey is the longest standing candidate, having applied already in 1987, but have still not closed all of their chapter negotiations. Controversy over the country’s media freedom and the issue of Cyprus still remain. “I think that Turkey and the European Union have joint interests” said Dutch MEP Johannes Cornelis van Baalen. “We should be strict and I see a problem of freedom of the media in Turkey and civil liberties have to be strengthened. Not for me, but for the people living in Turkey and for Turkey becoming close to Europe. An accession of Turkey to the EU should happen if they are ready, not before. I say let’s work hard, it will take time, but Iet’s take the time”. The argument for further enlargement goes that if the EU should keep to its values of being a space of unity in diversity, as well as a promoter of stability and prosperity in Europe, it should continue to bring together the countries that share the common values of freedom, democracy, the rule of law and respect for human rights. For enlargement to continue is likely, but under which forms, and which country will come next, remains to be seen. To know more about Joost Korte’s or Johannes Cornelis van Baalen’s views on enlargement, read the interviews on UNITEE’s blog.